ٱندونزی یاٛ ڤلاتٱ کاٛ ها د هارگٱ ٱفتاوزنوݩ هومبٱست آسیا. پاتٱخت اؽ ڤلات شٱئر جاکارتا ٱ. ↑ "Pancasila". U.S. Library of Congress. 3 February 2017. Archived from the original on 5 February 2017. http://countrystudies.us/indonesia/86.htm. Retrieved 5 February 2017. ↑ Na'im, Akhsan; Syaputra, Hendry (2010). 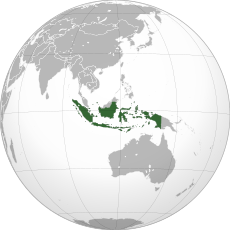 "Nationality, Ethnicity, Religion, and Languages of Indonesians" (in id). Statistics Indonesia. Archived from the original on 23 September 2015. http://www.bps.go.id/website/pdf_publikasi/watermark%20_Kewarganegaraan%2C%20Suku%20Bangsa%2C%20Agama%20dan%20Bahasa_281211.pdf. Retrieved 23 September 2015. ↑ "UN Statistics". United Nations. 2005. Archived from the original on 31 October 2007. http://unstats.un.org/unsd/demographic/products/dyb/DYB2004/Table03.pdf. Retrieved 31 October 2007. ↑ "World Economic Outlook: Report for Selected Countries and Subjects - Indonesia". International Monetary Fund. April 2017. Archived from the original on 10 October 2017. http://www.imf.org/external/pubs/ft/weo/2017/01/weodata/weorept.aspx?sy=2015&ey=2022&scsm=1&ssd=1&sort=country&ds=.&br=1&pr1.x=76&pr1.y=9&c=536&s=NGDPD%2CNGDPDPC%2CPPPGDP%2CPPPPC&grp=0&a=. Retrieved 10 October 2017. ↑ ۸٫۰ ۸٫۱ ۸٫۲ ۸٫۳ "Report for Selected Countries and Subjects - Indonesia". International Monetary Fund. http://www.imf.org/external/pubs/ft/weo/2017/02/weodata/weorept.aspx?pr.x=34&pr.y=15&sy=2018&ey=2022&scsm=1&ssd=1&sort=country&ds=.&br=1&c=536&s=NGDPD%2CPPPGDP%2CNGDPDPC%2CPPPPC&grp=0&a=. Retrieved 11 January 2018. د نۊ زنٱ بیٱ د"https://lrc.wikipedia.org/w/index.php?title=ٱندونزی&oldid=104360"
اؽ بٱلگٱ ایسنؽا آلشت بیٱ د ‏۲ فڤریٱ ۲۰۱۹، د ‏۱۵:۱۴.